I’m always on the lookout for simple, healthy, protein-packed snack recipes. These Carrot Banana Muffins are one of my new favorite grab-and-go breakfast items. They’re both delicious and easy to freeze, which is perfect for a make-ahead breakfast you can eat in the car. I’m also planning to freeze a huge batch of these to have on hand after Baby Brother arrives. Packed with nutritious almond flour plus fruit and veggies, these Carrot Banana Muffins are definitely kid-friendly. I like to serve them with bacon, plus fresh fruit or a fruit smoothie. 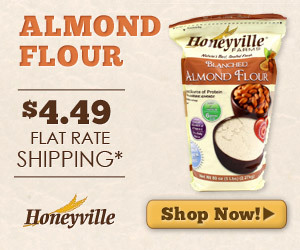 My favorite almond flour from Honeyville Grains is on sale! Actually, everything in Honeyville Grains’ “Gluten Free” category is on sale, with the coupon code for 15% off (see below). This is one of their best sales, and it’s just in time for all your holiday baking. Recently, we enjoyed a morning of pear-picking with some of our favorite friends. The kids had a blast, and picked way too many pears for us to eat in a reasonable time frame. Fall is in the air, which of course makes us want to bake all sorts of pumpkin goodies. Here’s a healthy version of one of my all-time favorite pumpkin treats: Pumpkin Chocolate Chip Cookies. Sweetened with honey, liquid stevia and mashed banana, these pumpkin cookies are free of refined sugar as well as gluten. Almond flour packs a nutritional punch and orange extract (or essential oil!) rounds out the flavor. 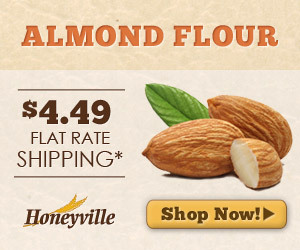 I always buy their blanched almond flour in the 25-pound quantity, but you can order it in much smaller amounts. This Chocolate Zucchini Bread is so easy, and so tasty. You might also like to know how fantastic it tastes cold, straight from the fridge. Especially while your children are resting upstairs and you’re all alone downstairs. Just a thought. Actually, everything at Honeyville Grains is on sale, with the coupon code for 10% off (see below).